Today I did it ! 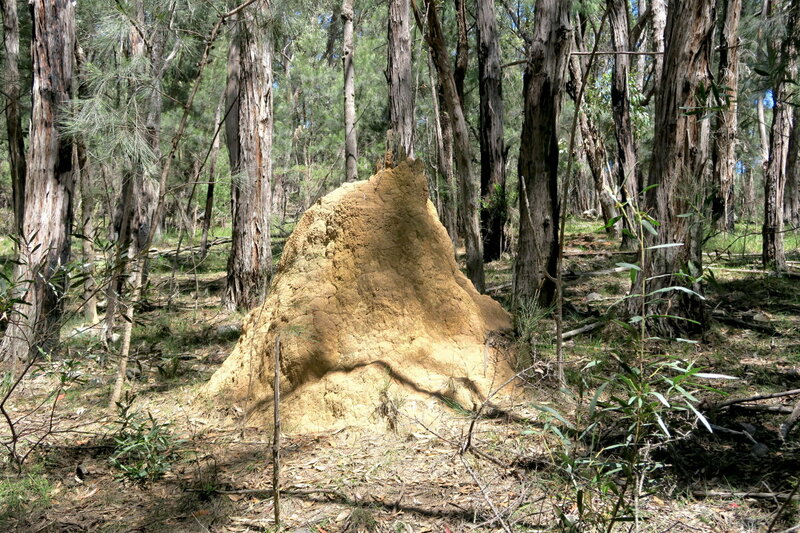 - Mt Mouin: It has 2 peaks, eastern and western peaks. 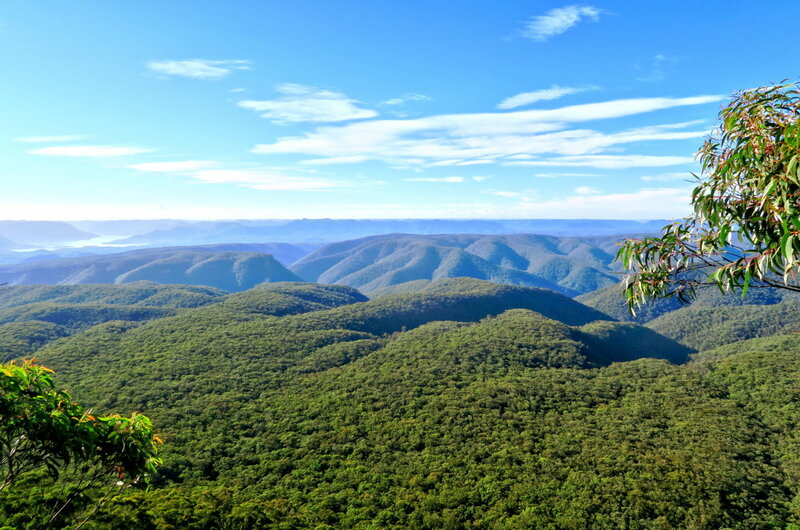 There are splendid views from rocky lookouts a few steps from the eastern peak summit. 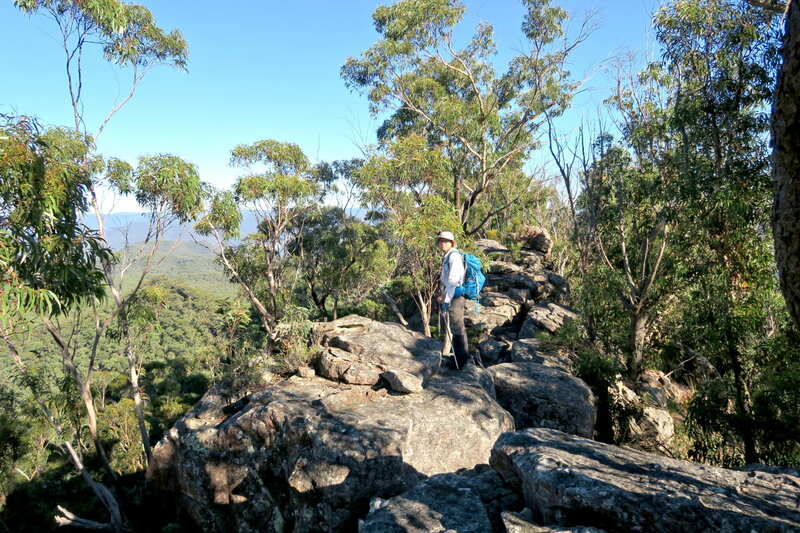 - Mt Warrigal: Highest of all the Wild Dog Mountains. The entire mountain is surrounded by cliffs; and a dearth of information on the Internet on how best to climb it. As there is hardly any breach in the cliffs that would allow a non-rock climber to scramble up, and so it seems that people who know the way up are keeping it a secret. Rumour has it that a passage is possible on the eastern side. Today we couldn't find it. So we end up circumnavigating 2/3 of the mountain in a clockwise direction; and climb up its cliff via the exact same spot on the western side that Saf and I found 10 months ago. In that trip we walked 1/3 of the way around the mountain in an anti-clockwise direction. So now, taking into account of the 2 trips, I have circumnavigated the entire mountain by hugging along the base of its cliffs. 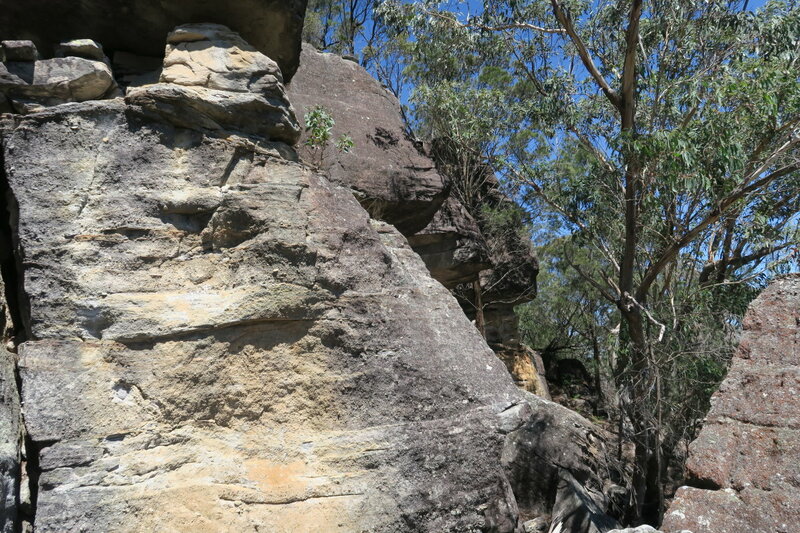 - Mt Merrimerrigal: Like Mt Warrigal, it is mostly surrounded by cliffs. A way up is via a short tunnel on the west side near its northern tip. 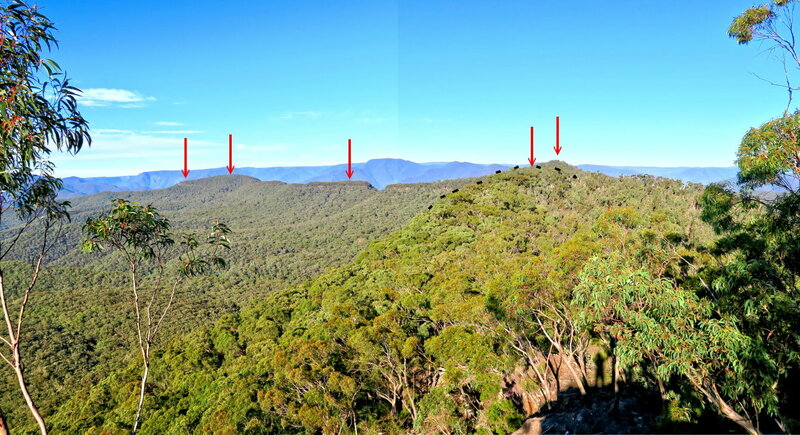 The top of Mt Merrimerrigal is a broad plateau, as flat as a pancake. 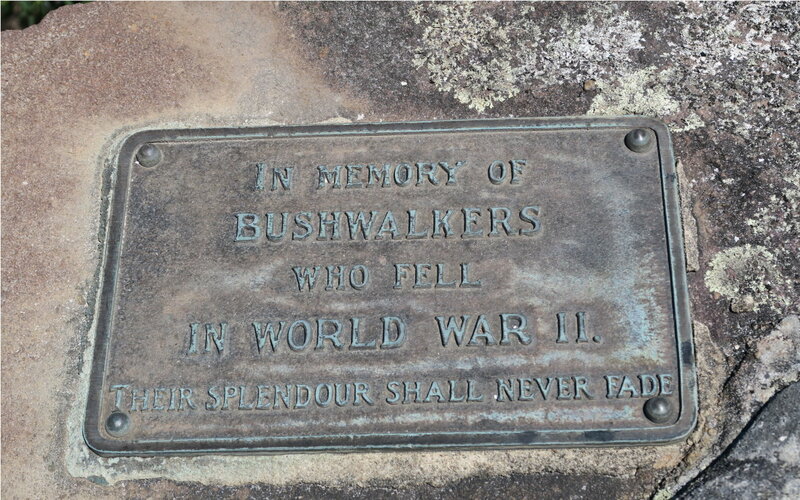 - Splendour Rock: It is a memorial place for Sydney bushwalkers who died fighting in World War II. Fantastic views from there ! Explore around, try to find a way to climb up the cliffs. No success. 1) The night before, we camp out here at Dunphys Camping Area. 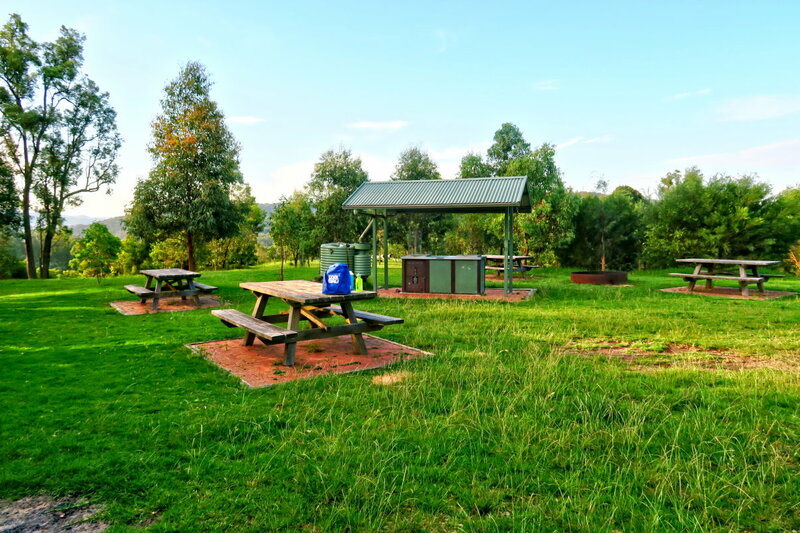 3) Narrow Neck Plateau overlooks the camping area. No - we are not going there. 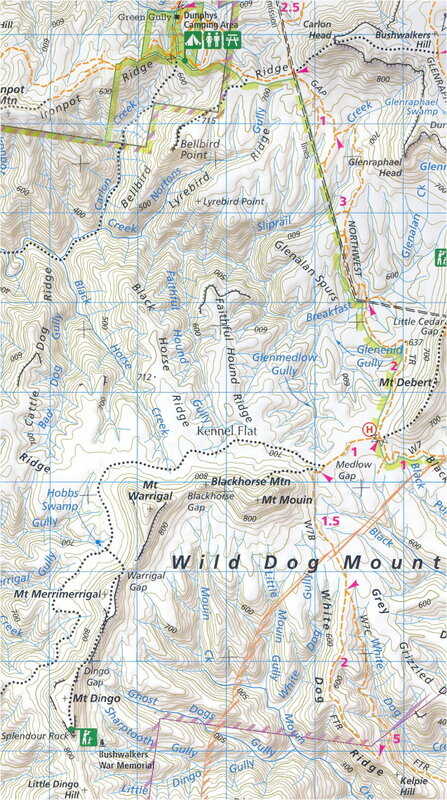 We'll be going to Mt Mouin first, then the rest of the Wild Dog Mountains. 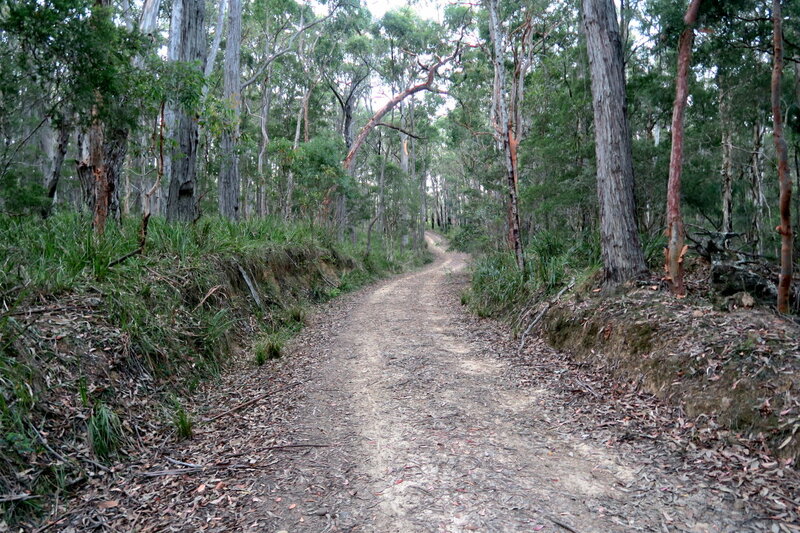 5) We've turned west into a foot trail that leads towards the northern flank of Mt Mouin. 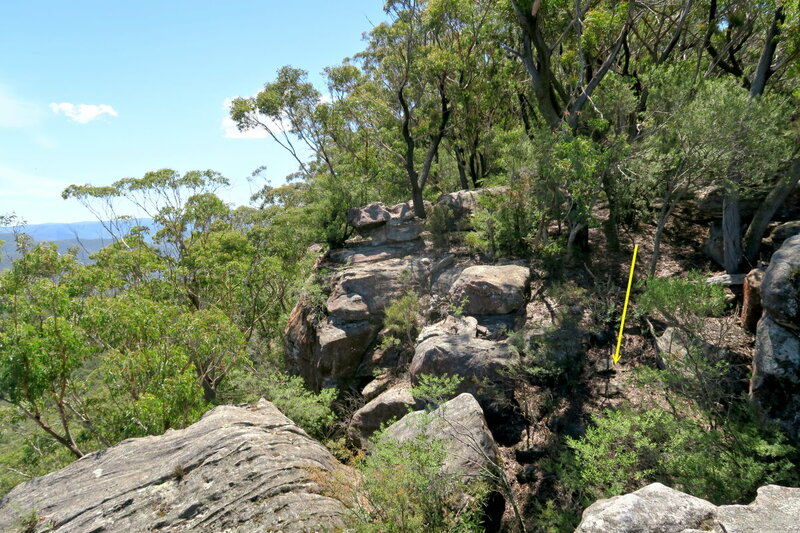 6) The foot trail ends here at a lookout towards the north with a view of Narrow Neck Plateau. It is not a particularly impressive lookout - too many trees around. So why built a foot trail to end at here, the middle of nowhere? 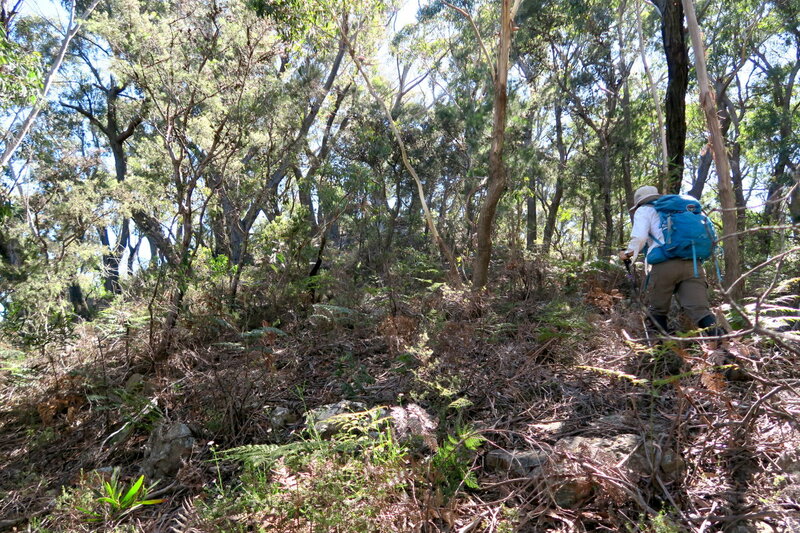 7) From the lookout, we bushbash directly up the slope to climb Mt Mouin eastern peak ... its cliff is just in front. 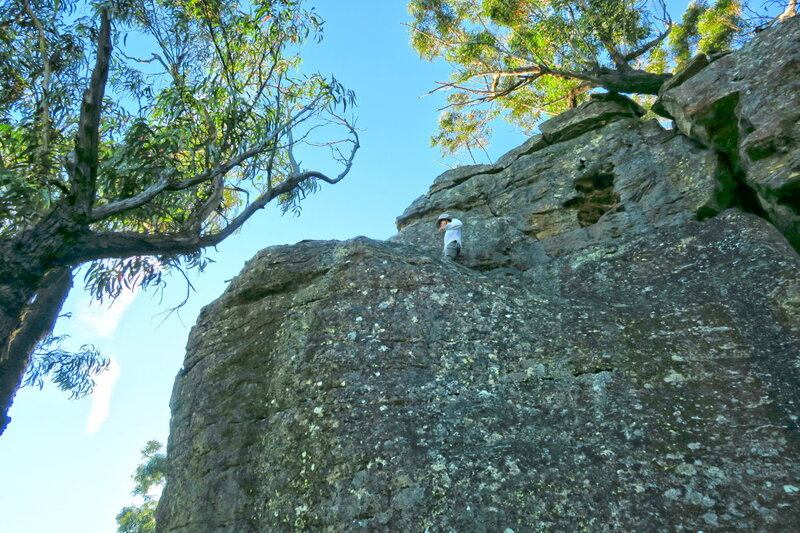 8) Cliffs of Mt Mouin eastern peak ... we need to get to the top of this cliff ! 9) RZ finds a way up ... so we thought. 10) This is as far as she can go. The rest of the cliff is too steep to climb. 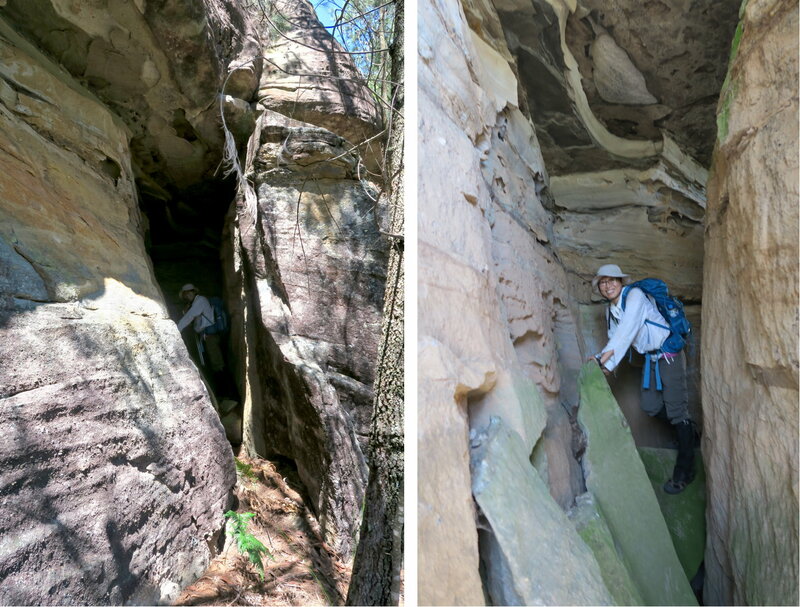 So she climbs back down the step-like vertical slit in the previous photo; and we search towards the right (west) for another way up. 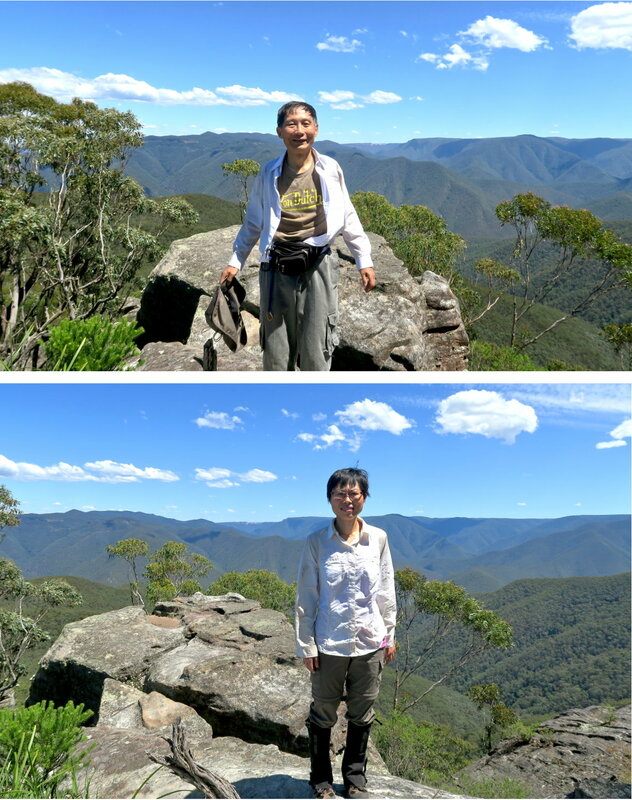 11) We make it to the summit of the eastern peak of Mt Mouin, 945 meters, after finding another way to climb up the cliff, not too far to the right (west) of the previous 2 photos. At the exact summit, there is not much of a view :-( Too many trees. 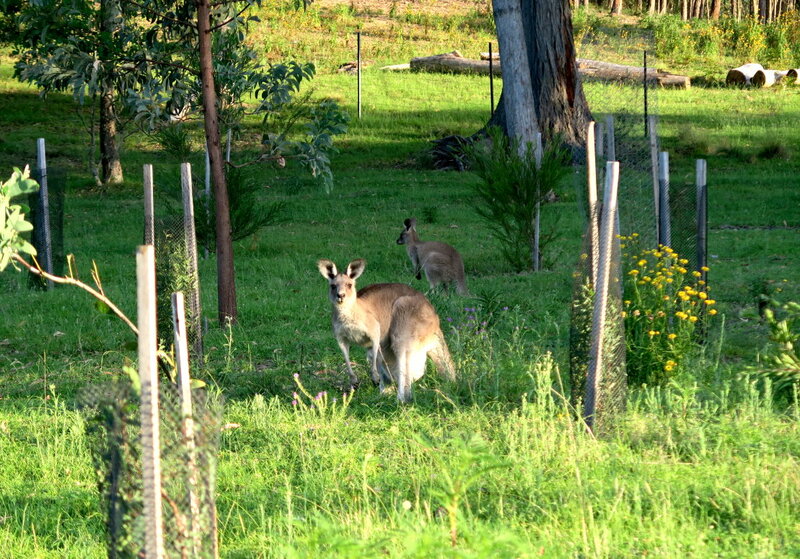 But a few steps away, there are lookouts where we enjoy the wonders of the Blue Mountains scenery. 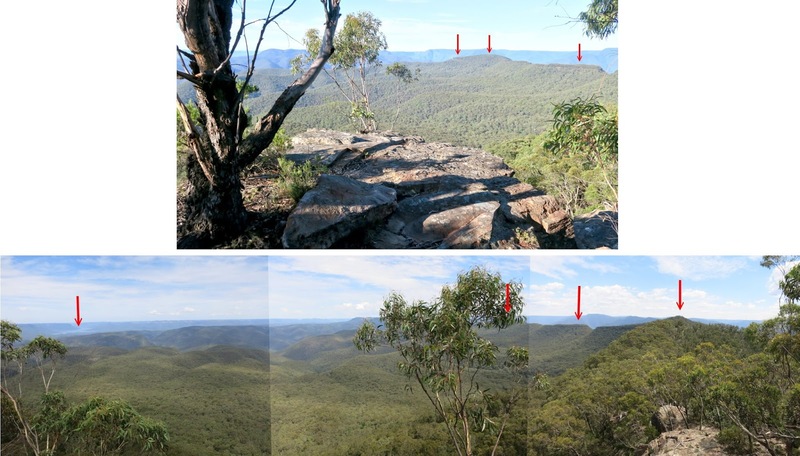 12) The slab of rock in the upper pic is one of the lookouts. Today, we'll be going all the way to Splendour Rock. The lake on the left edge of the pic is Lake Burragorang, towards south-east. 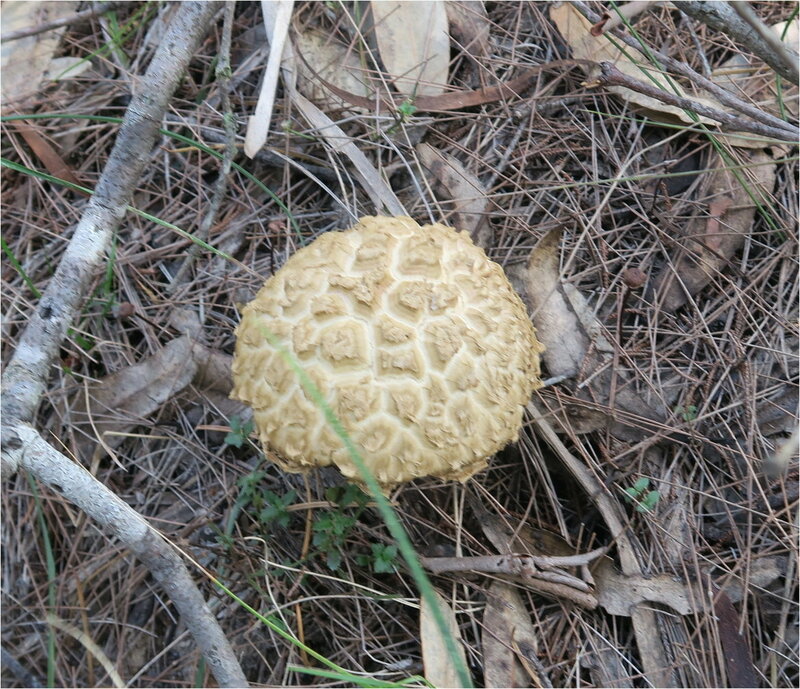 - Mt Mouin western peak, we are going there next. The red oval is Ironpot Mountain/Ridge. - Ironpot Mountain/Ridge is the darker coloured big mountain in the middle of the pic. - The red oval is Ironmonger Spur. 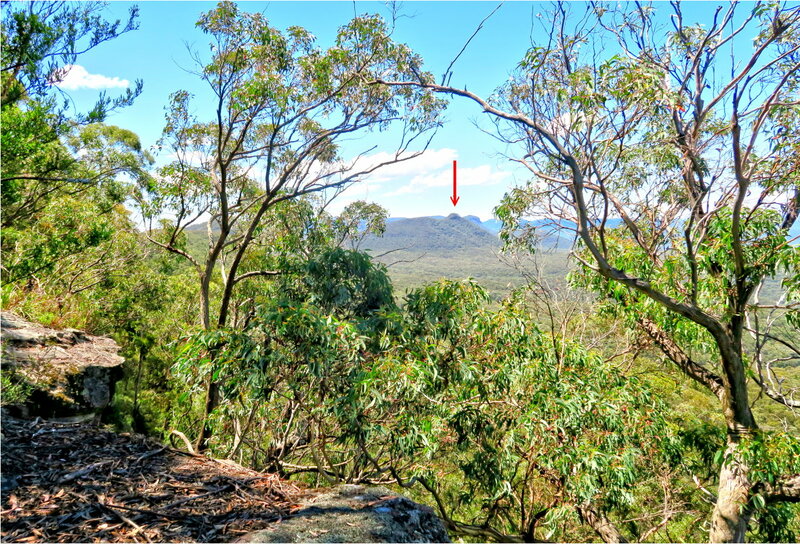 - The red arrow on the left points to Ironmonger Hill, 765 meters. 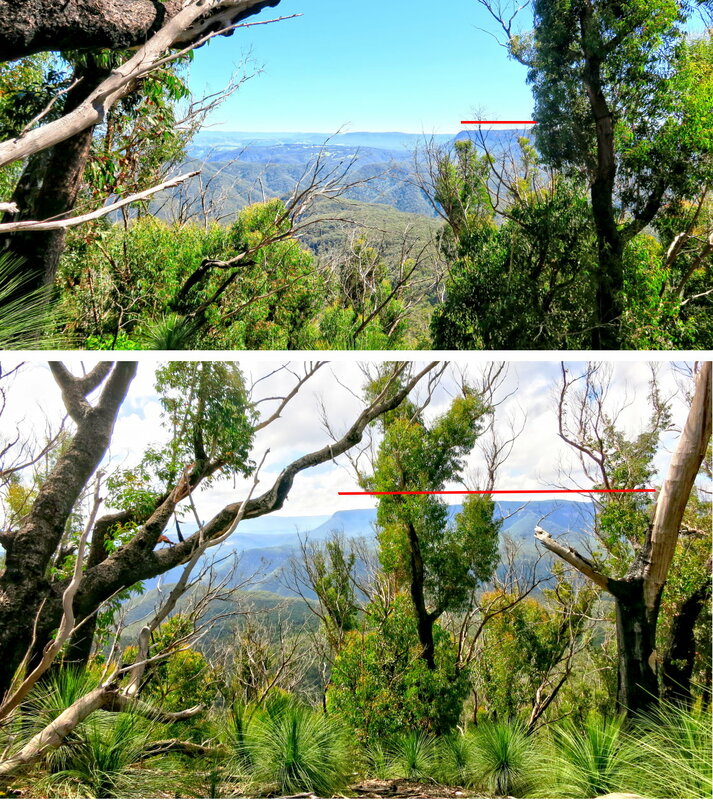 - The red arrow on the right is Bellbird Lookout. 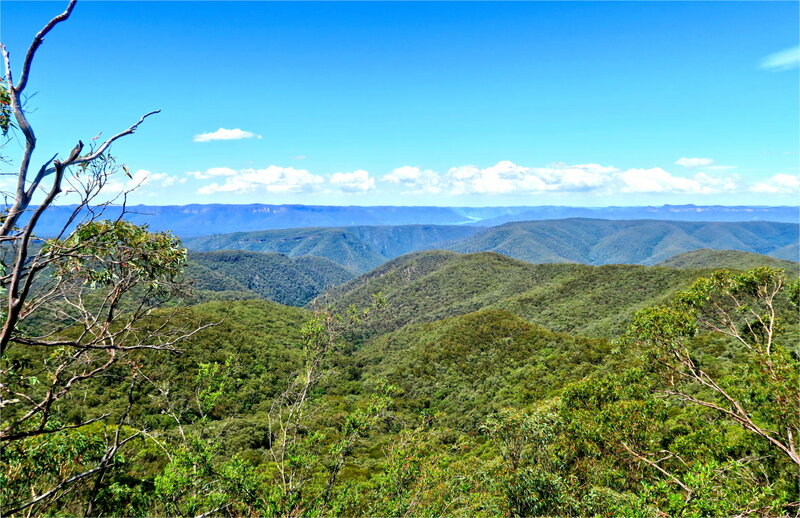 - The spur slanting downwards from Bellbird Lookout towards the left is Bellbird Ridge. 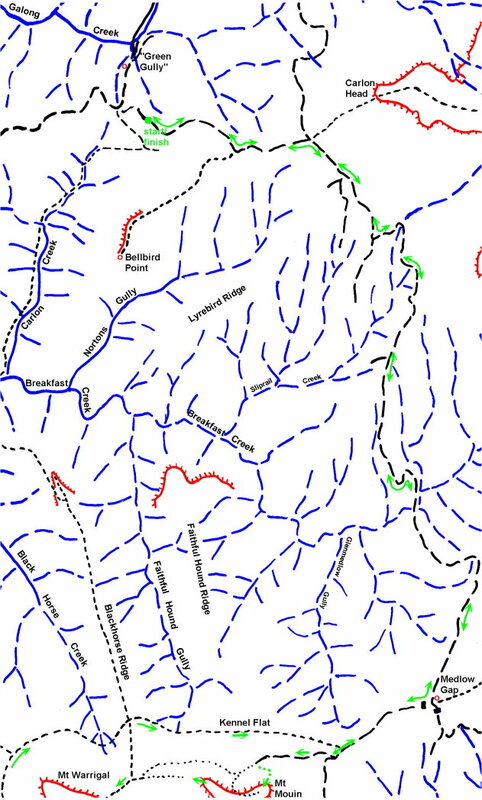 - The yellow line on the right is Faithful Hound Ridge. - The yellow line on the left is Black Horse Ridge. 17) We are now walking on top of the ridge towards Mt Mouin western peak ... in the pic, you can see the slope dropping away from us on both sides. 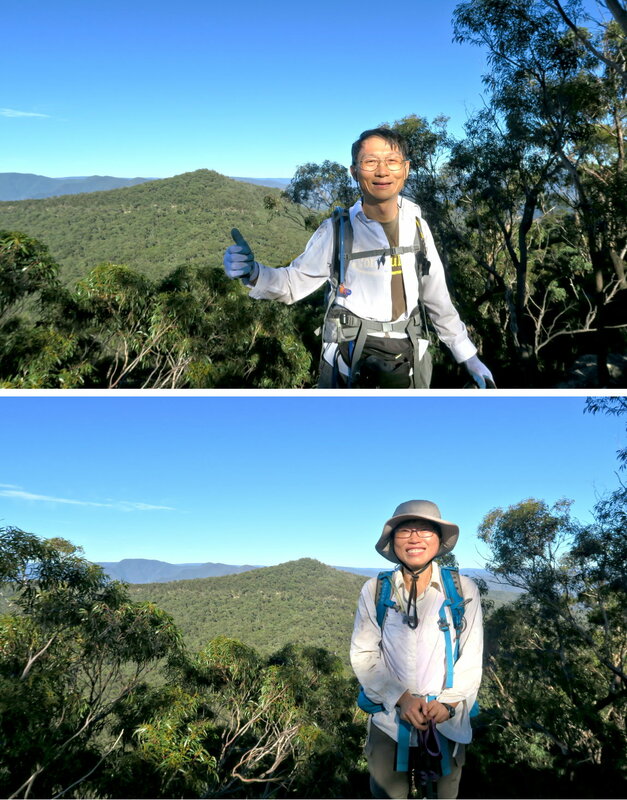 18) We make it to Mt Mouin western peak summit, 930 meters. The view is limited due to too many trees. However we can see Mt Warrigal ... my thumb is pointing at it. Just like photo #17, we are walking on top of the ridge with slopes dropping away on both side ... like waking on the edge of a razor blade. 20) This must the most photographed rock on the Mouin-to-Blackhorse ridge ... 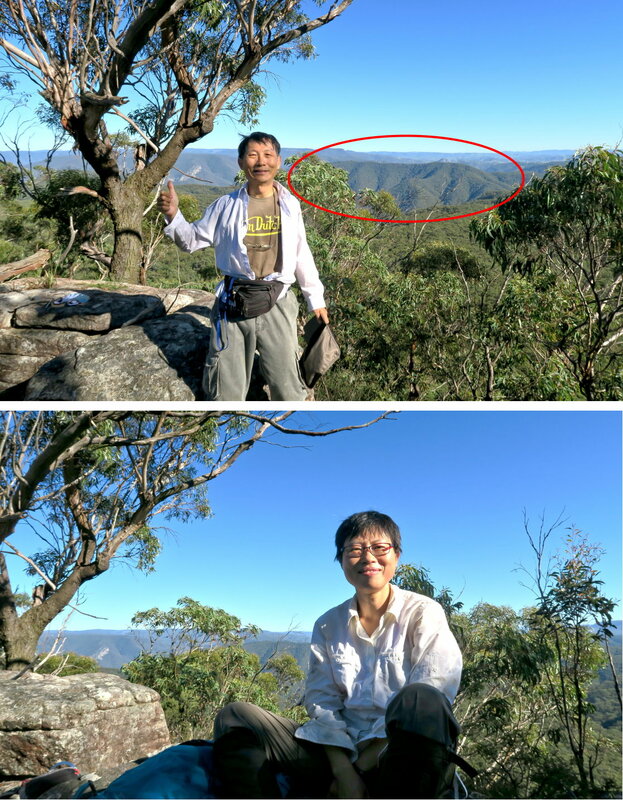 There is the urge to pose in front of it :-) Peter Cai, a keen bushwalker based in Sydney, named it Tofu Ru Rock 豆腐乳石. 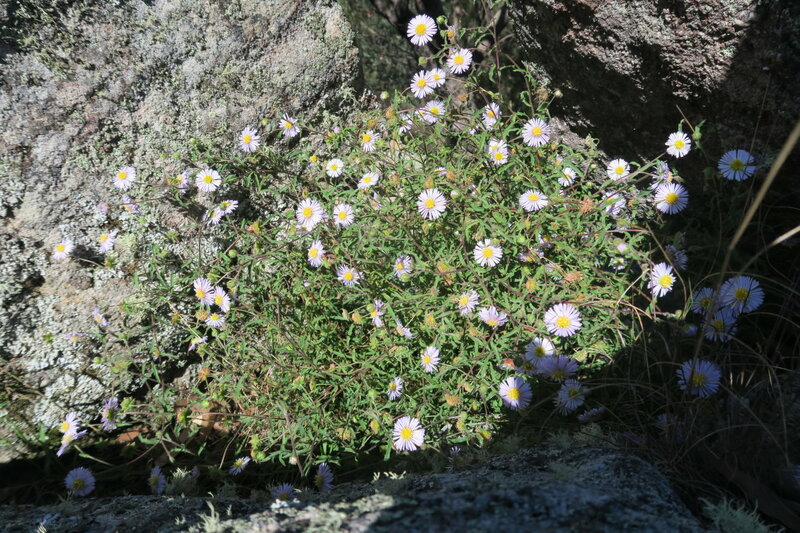 21) We arrive at the top of Blackhorse Mountain, 865 meters. The view from here is limited due to too many trees. - The red oval is Ironpot Mountain/Ridge. 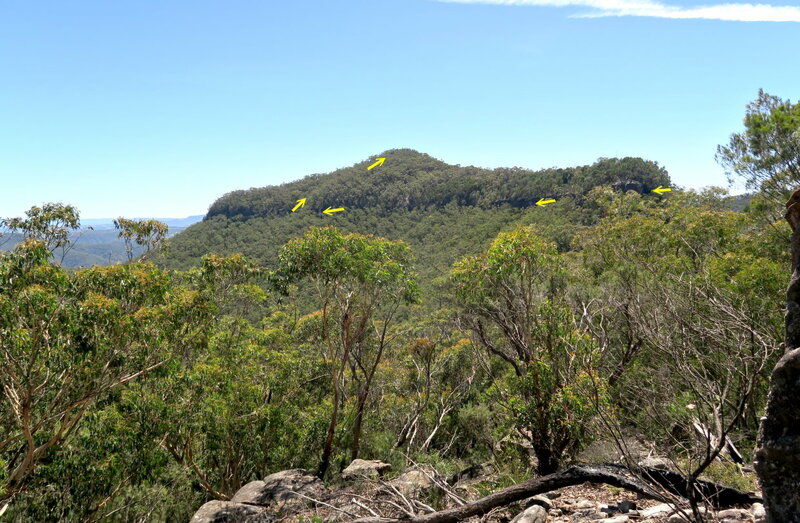 22) From Blackhorse Mountain, follow the ridge brings us to the eastern tip of Mt Warrigal cliffs. 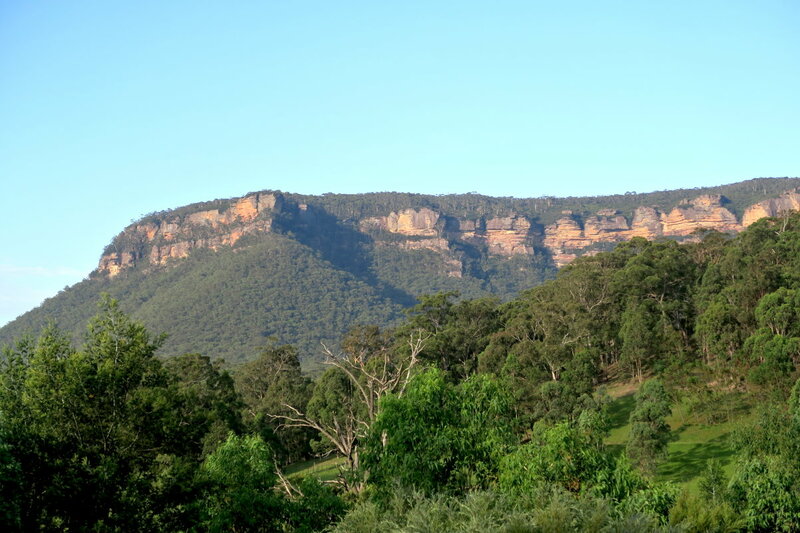 Mt Warrigal is surrounded on all sides by cliffs. 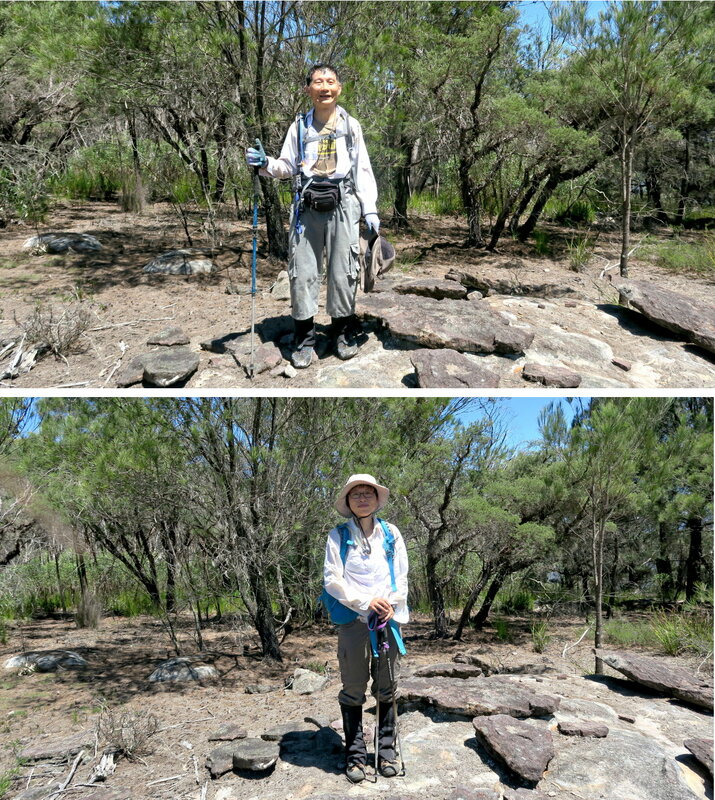 10 months ago, in 2015 April, Saf and I reached here via leech infested Carlon Creek Track and Black Horse Ridge. At the time, we turned right (towards west) in an attempt to find a way to climb up the cliffs. 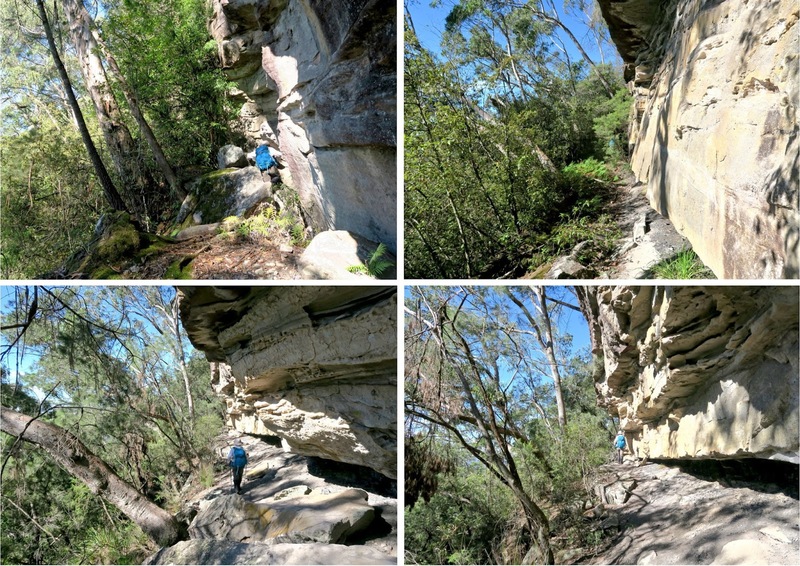 23) This time with RZ, we turn left to see if we can find an alternate way up the cliffs on the eastern side of Mt Warrigal. 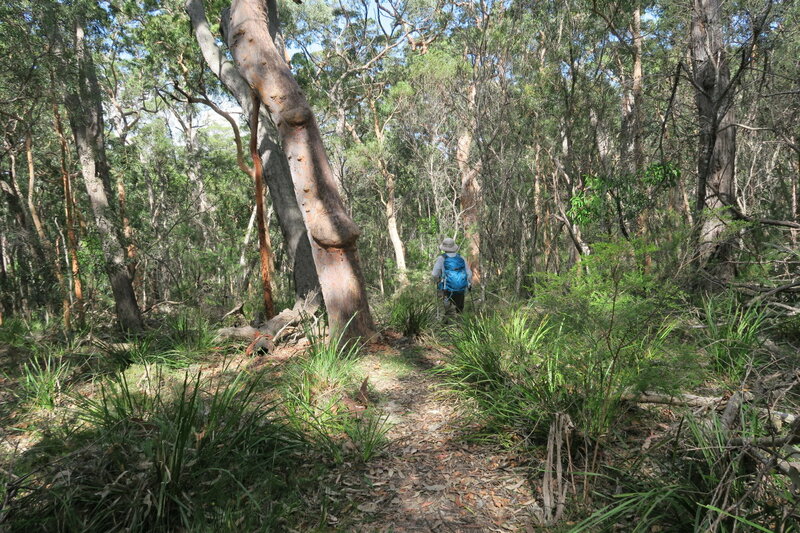 We hug close to the cliffs - There is a foot trail called "Wombat Parade" along the base of the escarpment. All along the eastern side of the cliffs, we couldn't find a way up (but note the "Post Script" in the previous paragraph). So now here at the southern tip, we have a crack at it. 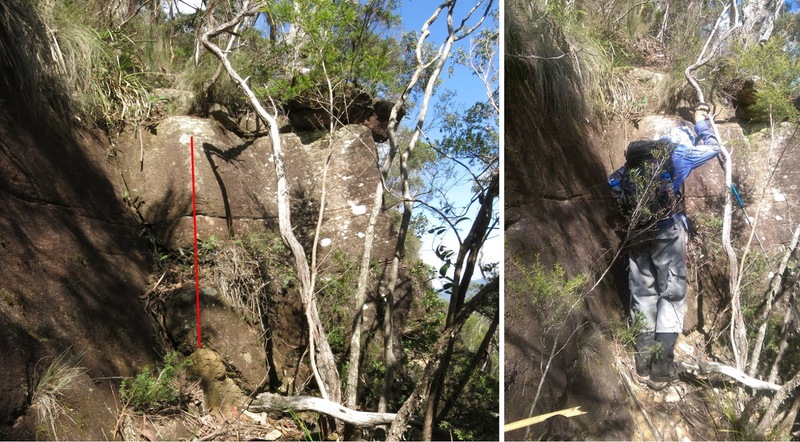 - Right pic: RZ has climbed up the steep face of this cliff. 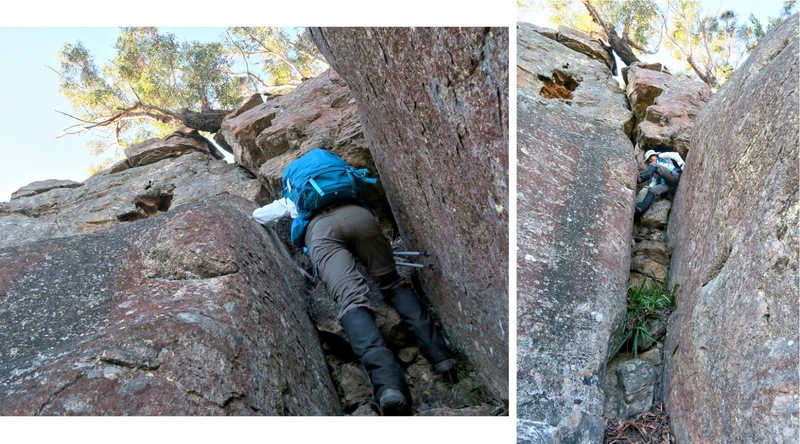 - Left pic: She walks along the ledge to the left in an attempt to find a way up. By now you should have noticed that RZ loves rock climbing, so I let her do the pioneering leg work of finding suitable routes up the cliffs :-) The idea is if the route is dangerous, she'll be the first to fall and I'll be spared :-) For gratitude, here, she kicks a BBIIGG rock down the cliff and almost have me killed !!! As we couldn't climb up Mt Warrigal from its southern tip, so we go around the tip and walk northward along the western side of the cliffs. 25) As we hug along the cliffs, we pass by this nice shelter where someone had built a fireplace. The upper photo is looking forward. The lower photo is looking backward. 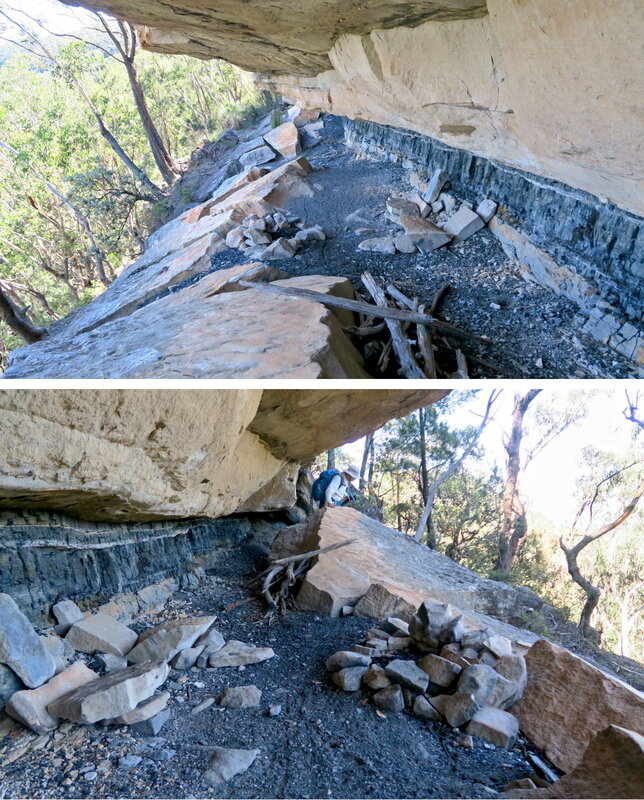 - Upper pic: After removing a rock or two from the cache. The cache seems to have been here for a long time. Whoever hid the stuff here had intended to come back ... but didn't. 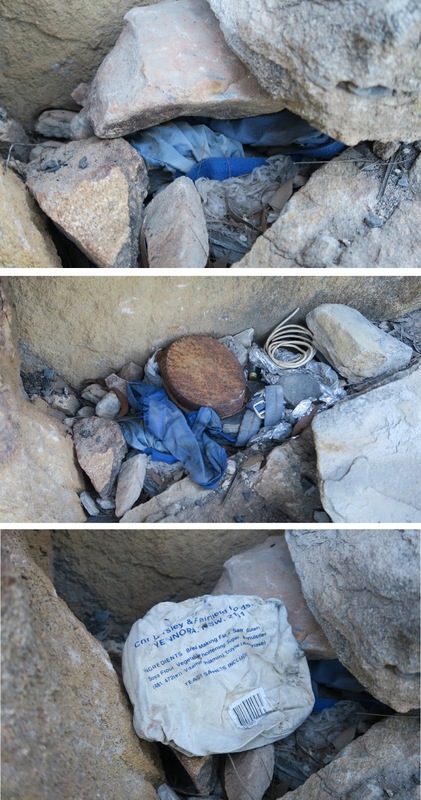 27) The cache is marked by stone cairns stacked against the cliff ... interesting. 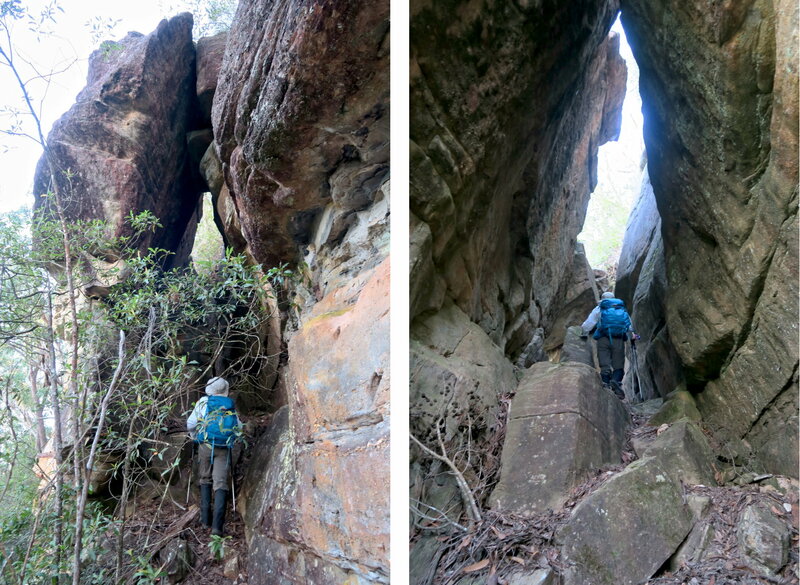 Right pic: We have turned the corner and RZ is climbing out. 29) After the fallen slab, we come to here ... about to pass through this tunnel, so we thought. But it turns out to be a dead end ... steep drop at the other end. So we go around it instead. 30) After going around the tunnel of the previous pic and walking further along, we come to this exact same spot where Saf and I managed to climb up the cliff 10 months ago in April 2015. These 2 photos were taken last year. 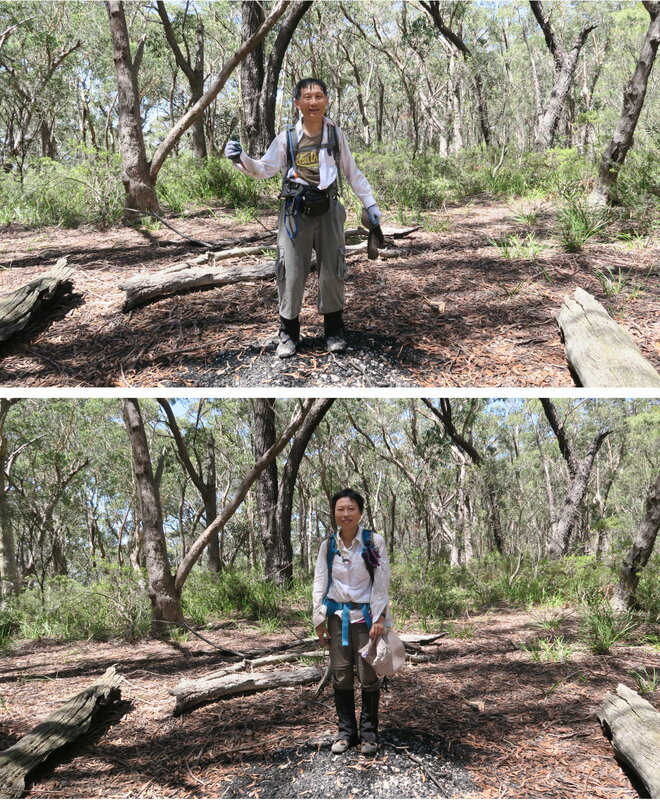 In the left pic, I have drawn a red vertical bar to indicate where my body was in relation to the photo on the right. 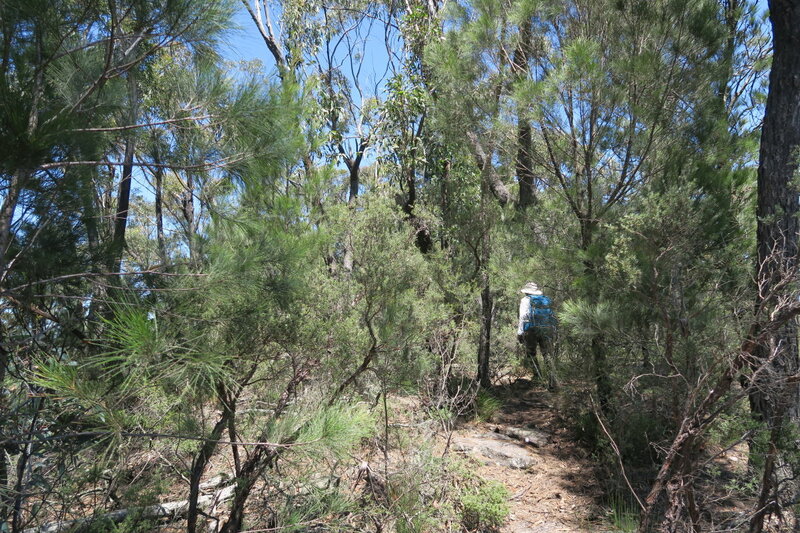 Taking into account the trip with Saf, I have now circumnavigated Mt Warrigal. As far as I can tell, this is the only place where a non-rock-climber like me can climb up the cliffs. Question: Has any one climbed up Mt Warrigal from the west like us? 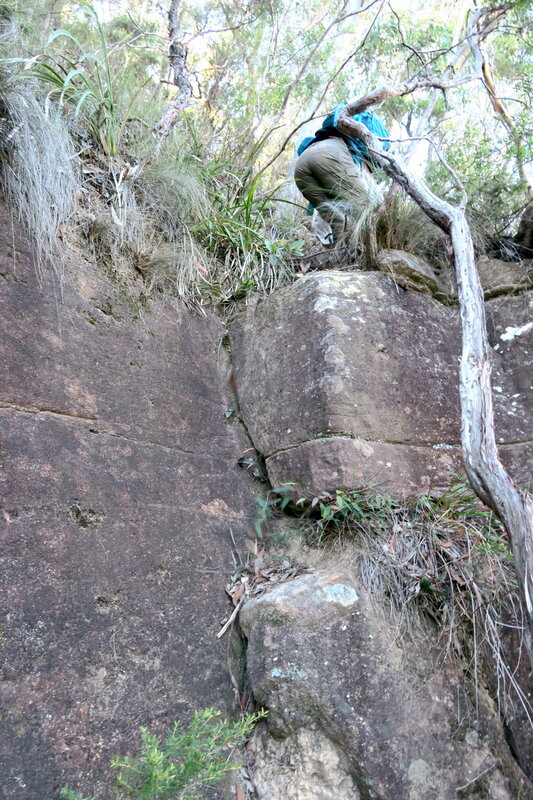 If not, I am laying the claim that Saf and I were the first people to climb up Warrigal this way. 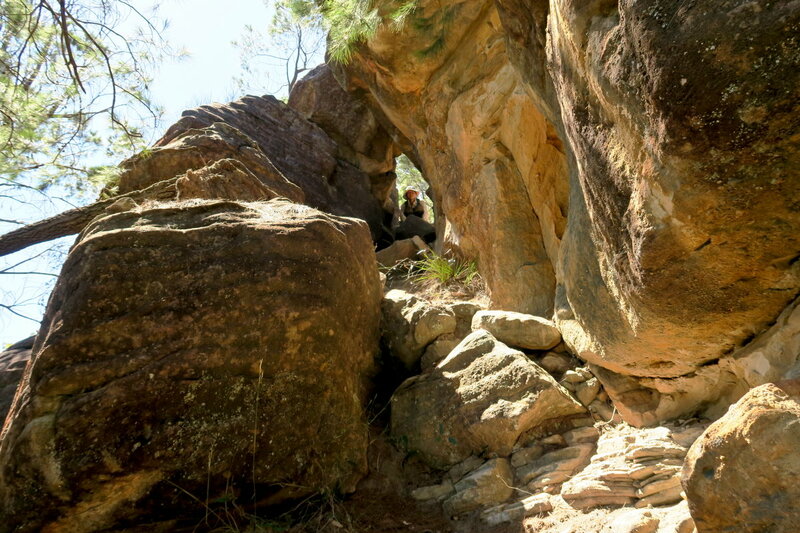 Rumour has it that it is possible to climb up on the eastern side, ie along Wombat Parade. But today, we couldn't find a way up from there. 31) RZ has just climbed up. 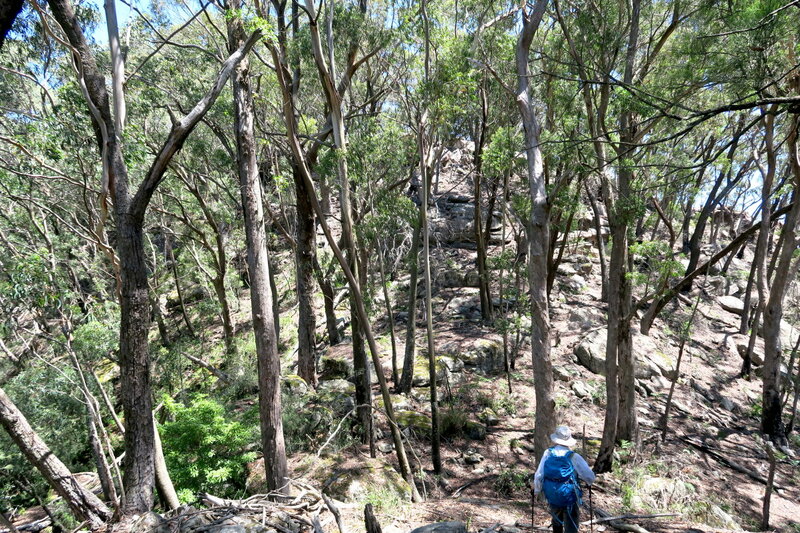 32) Mt Warrigal summit is just in front. Some one had built a cairn and planted a twig. 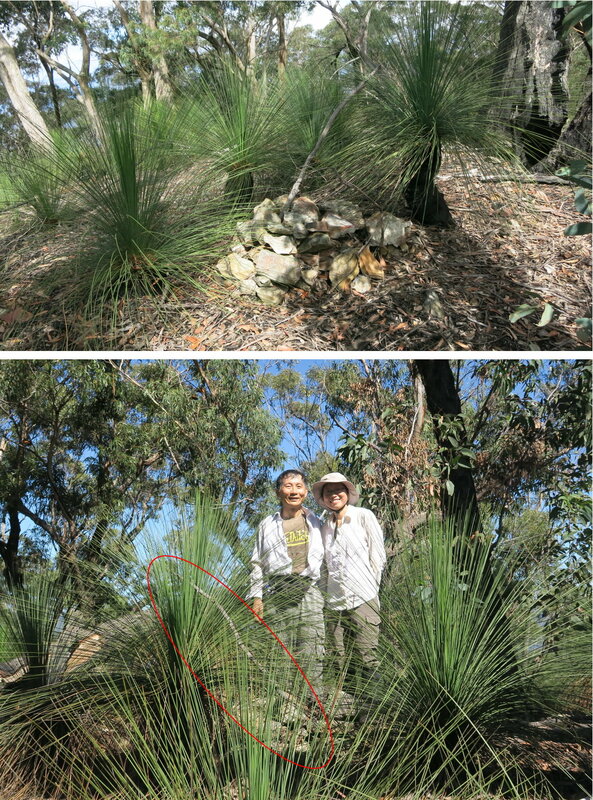 In the lower pic, the cairn and twig are in the red oval. 34) There are too many trees at the summit. Here are the partial views towards north. 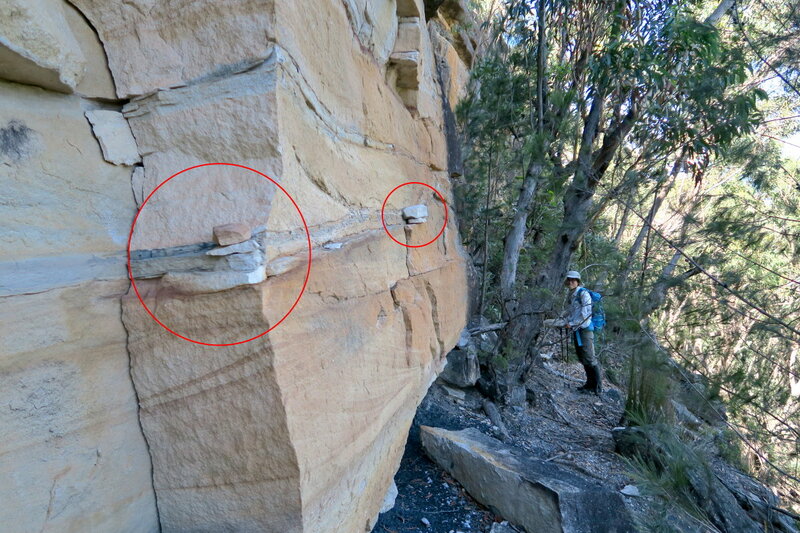 The red horizontal bars indicate where Narrow Neck Plateau is. 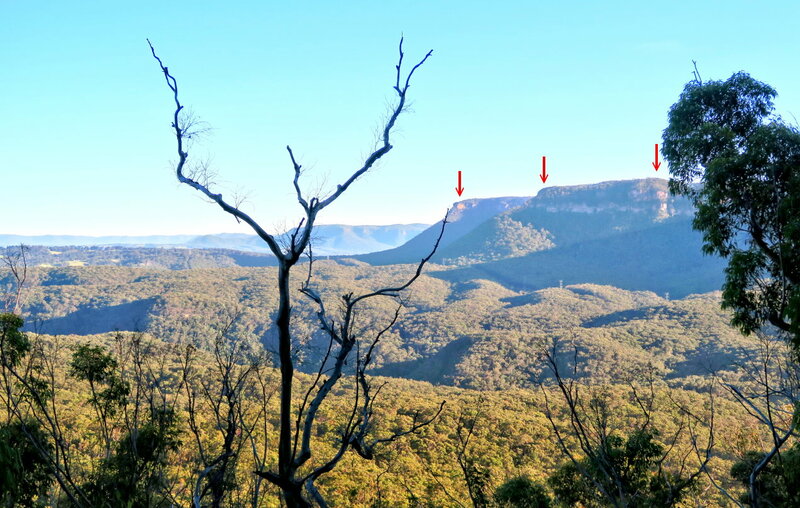 35) We retraced our steps, climbed down Mt Warrigal and is now back at the southern tip of the Warrigal cliffs and heading towards Mt Merrimerrigal, the peak in this pic. - We approached it from the non-camera facing side, north-east side. - Then hugged along the cliffs on the east side and walked towards the right until we reached the tip on the right (the southern tip). - After a hairpin 180 degree turn at the southern tip, we follow the yellow arrows (west side, ie camera facing side of the mountain) to the summit. 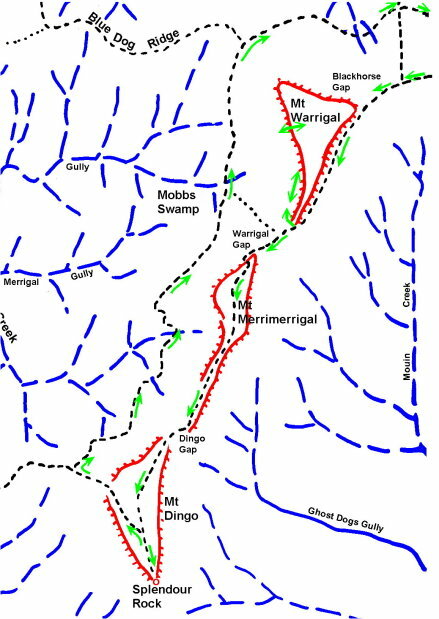 Like Mt Warrigal, Merrimerrigal is also almost completely surrounded by cliffs on all sides. From here, we go around to the right, ie to the west side, to find a way up the cliffs. 38) Shortly after going the right, we come to this cave. 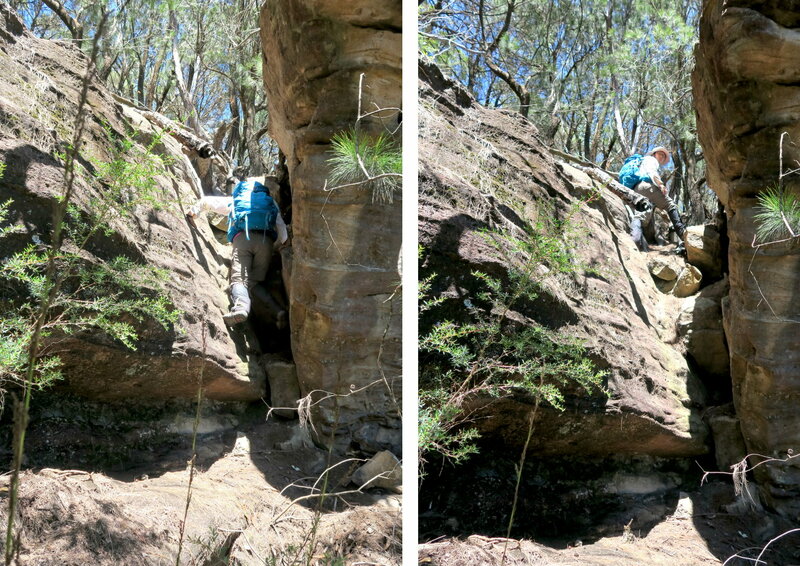 39) Going a bit more along is a break in the cliffs where we can scramble up. In the pic, RZ is waiting for me at the top of the tunnel. 41) Once through the tunnel, from the cliff edge is this nice view towards north. 43) ... Hard to tell where is the summit of Mt Merrimerrigal on a pancake ... We think this flat area is the highest point, 905 meters. We take a rest here ... have lunch at this highest point. 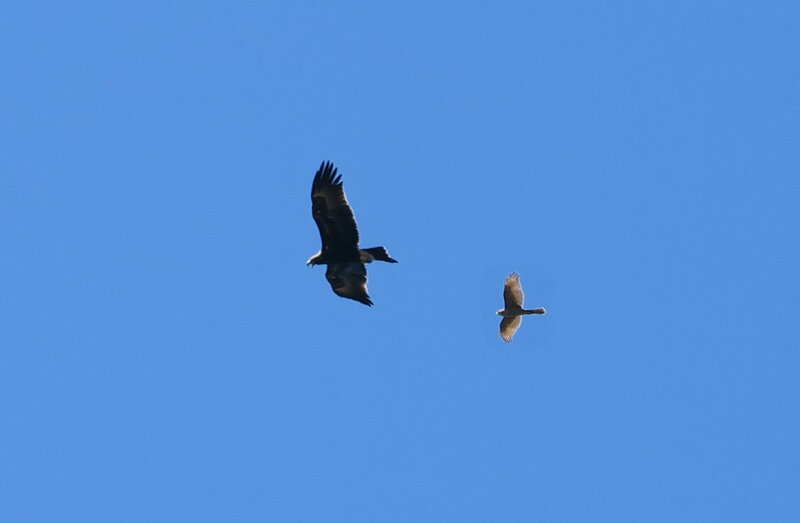 44) While having lunch, a Wedge-tailed Eagle (Aquila audax) and its juvenile keep circling above us. I don't think they are eyeing us as dinner. It looks like the mom is teaching the juvenile how to fly. 45) To get some sort of a view, you'll need to walk to a cliff edge. There is a faint track which goes along the top of the ridge. Someone had built a fire place right here ... otherwise, nothing special around. 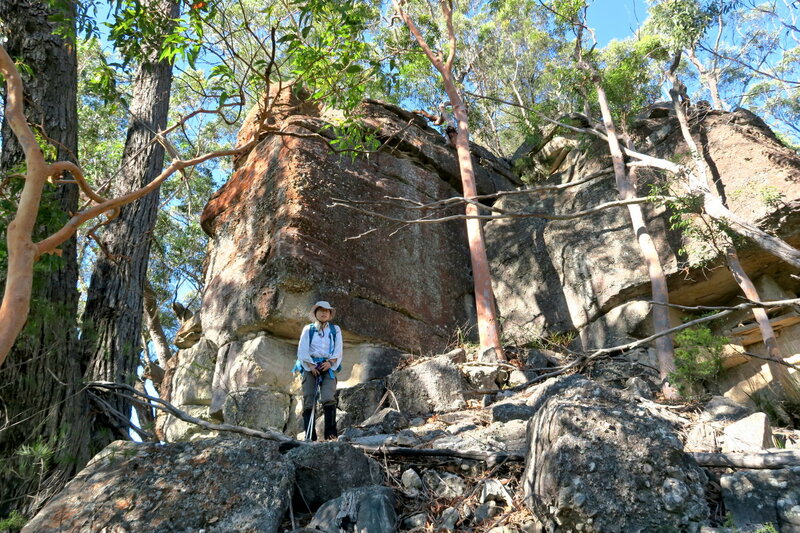 - The rock platform on the left side of the pic is a splendid lookout ... see photo #54. 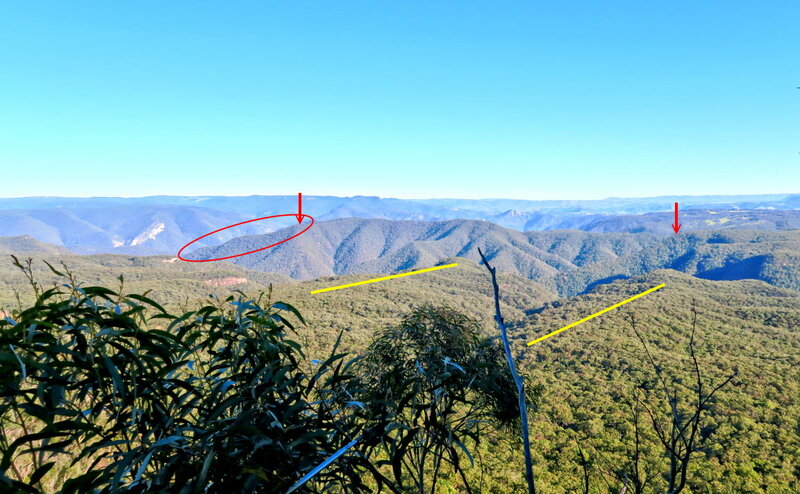 - The valley in the middle of the pic (towards south-west) is where Coxs River flows. 51) This is the memorial plate etched on the rock in the small red circle of the previous pic. and now deserve a well earned photo ! 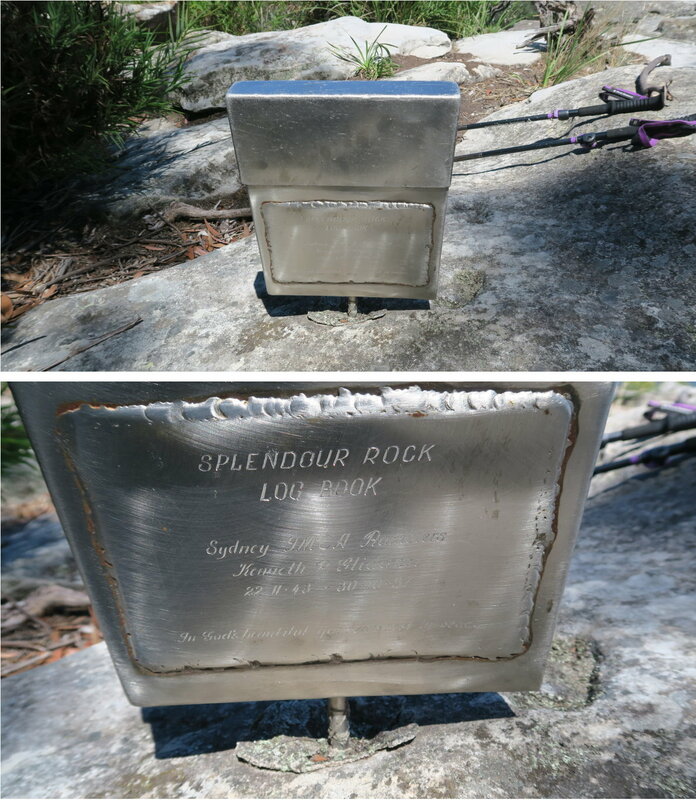 53) The name Splendour Rock is indeed appropriately named ... Fantastic scenery ! In middle of the pic, on the horizon, is Lake Burragorang - towards east. 54) This scene from south to north-west is taken at the tip of the rock platform in photo #50 ... at the small red circle there. - The red arrow on the right side of the pic points to Yellow Dog Ridge. - The valley at the centre of the pic is where Coxs River flows. 55) Towards North-east is Mt Mouin. 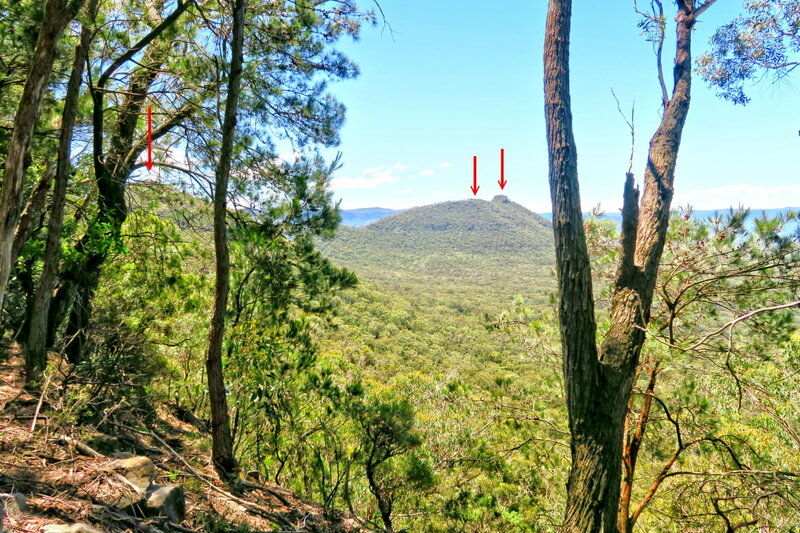 The red arrow points to its eastern peak. 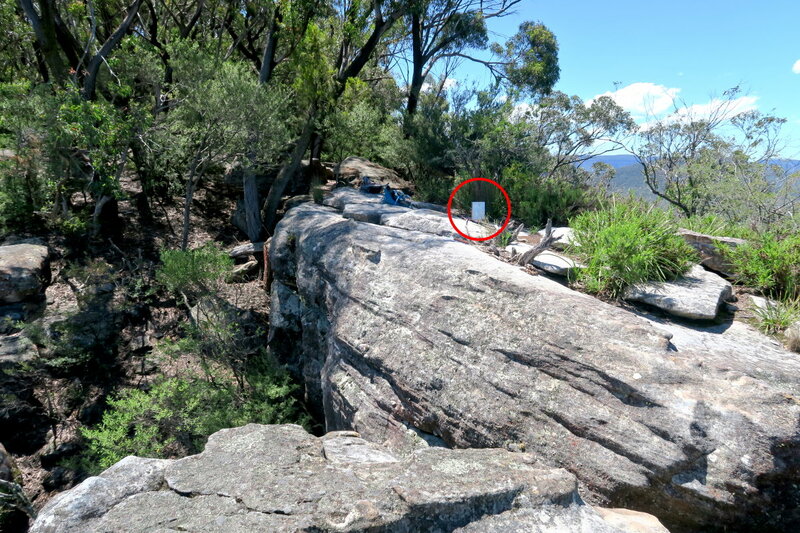 There is a metal box - the red circle. 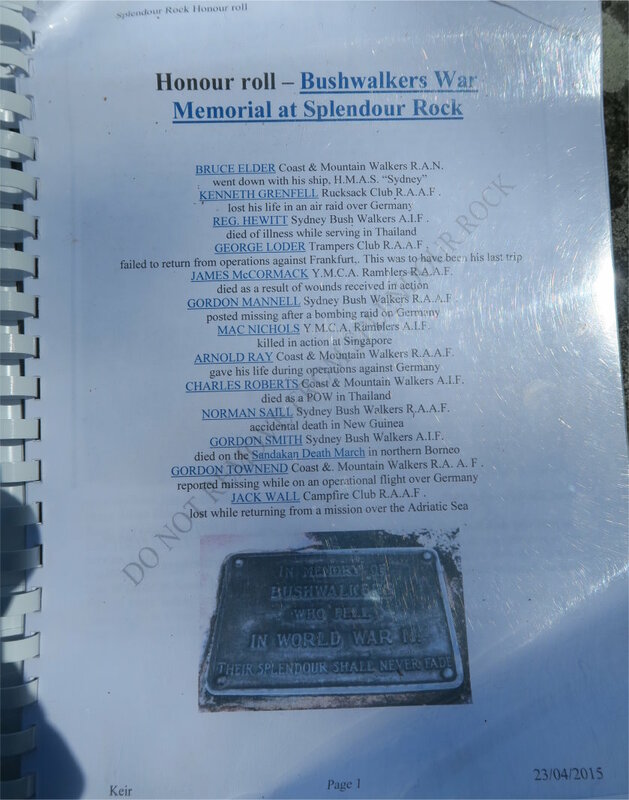 58) Inside the metal box, beside a log book, is a 34-page booklet: "Honour Roll - Bushwalkers War Memorial at Splendour Rock". 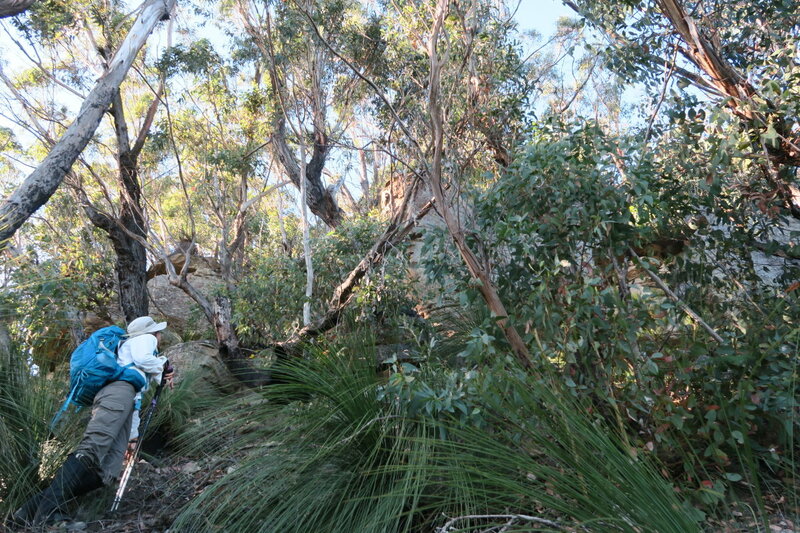 Well, even though Splendour Rock is so nice, we can't stay here forever ... time to leave by retracing our steps. 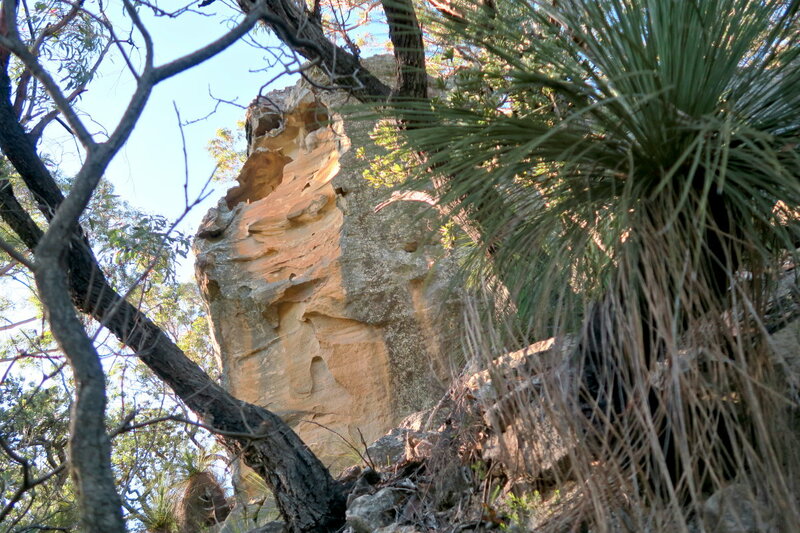 61) Halfway between Splendour Rock & Mt Dingo, we turn north-west to climb down Mt Dingo. 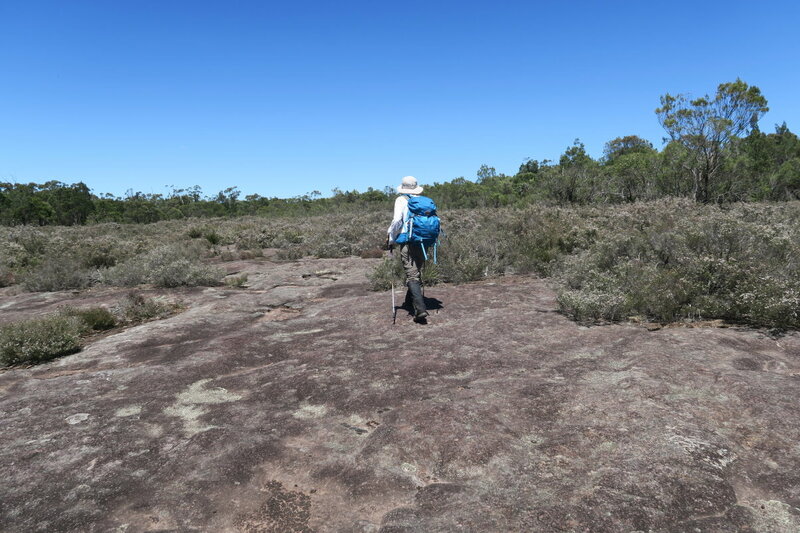 Then follow a foot track (this photo) that skirts around the base of the 5 Wild Dog mountains to meet up with Medlow Gap Northwest Firetrail. 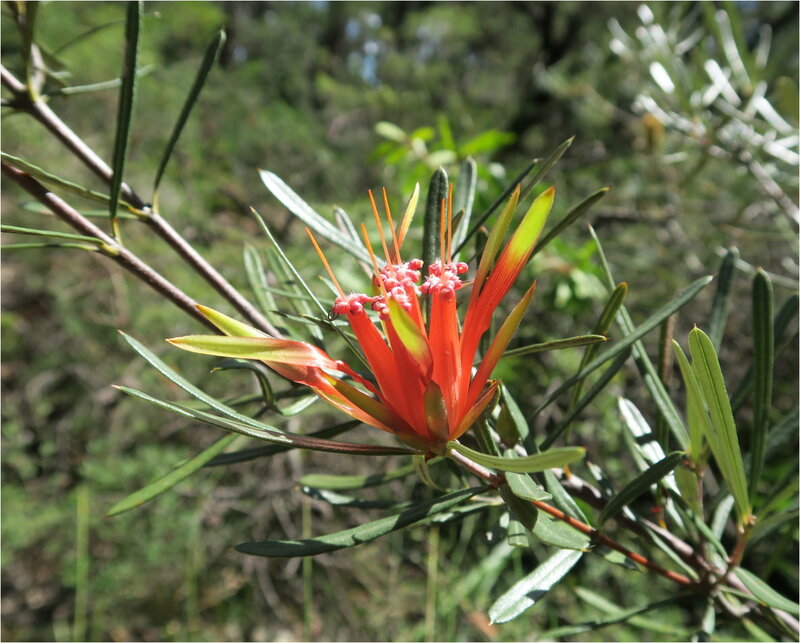 This flower is endemic to New South Wales, Australia; and grows in sandstone-based soils. 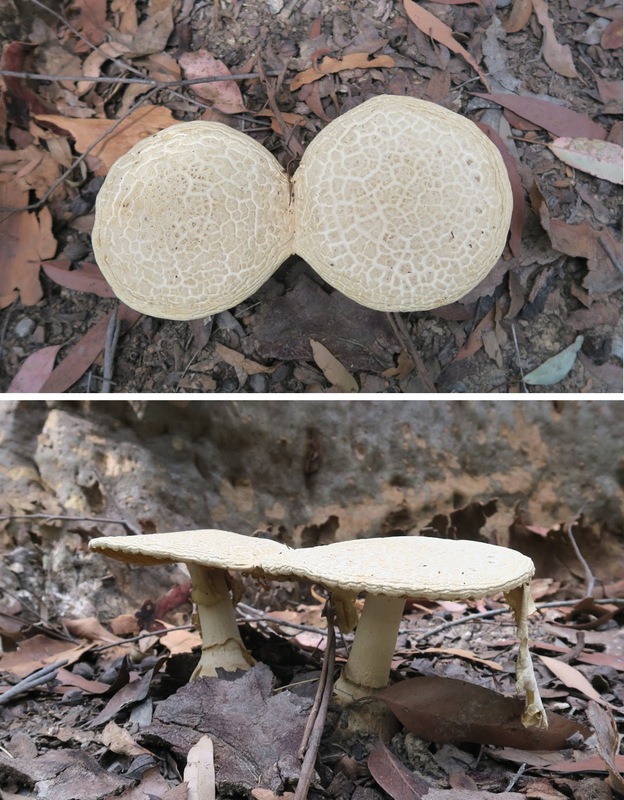 The 2 upper mushrooms seem to belong to the same species; and similarly the 2 lower ones. 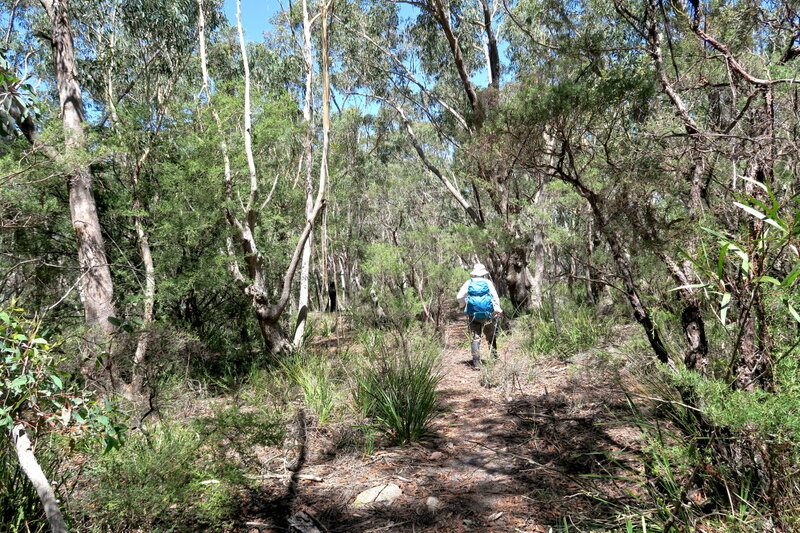 68) On the Medlow Gap Northwest Firetrail we occasionally get a glimpse of Narrow Neck Plateau. 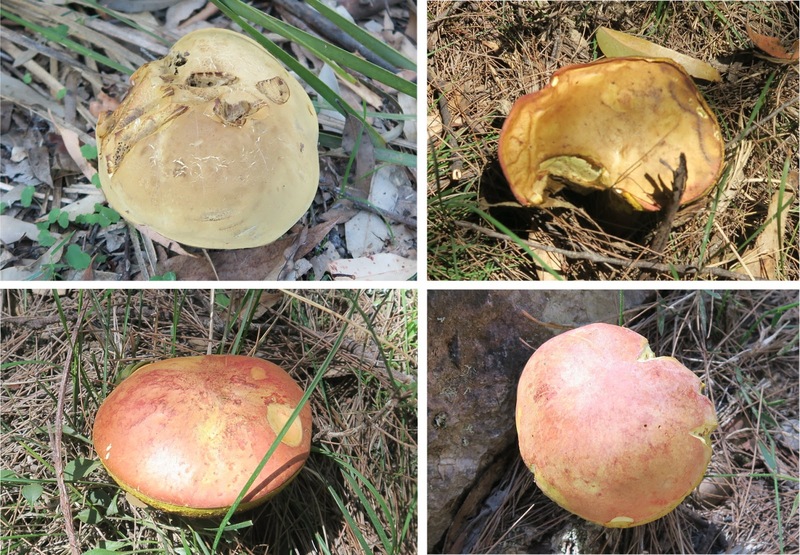 In these pics, the left most tip of the plateau is Black Billy Head. The right most tip is Clear Hill / Tarros Ladder. 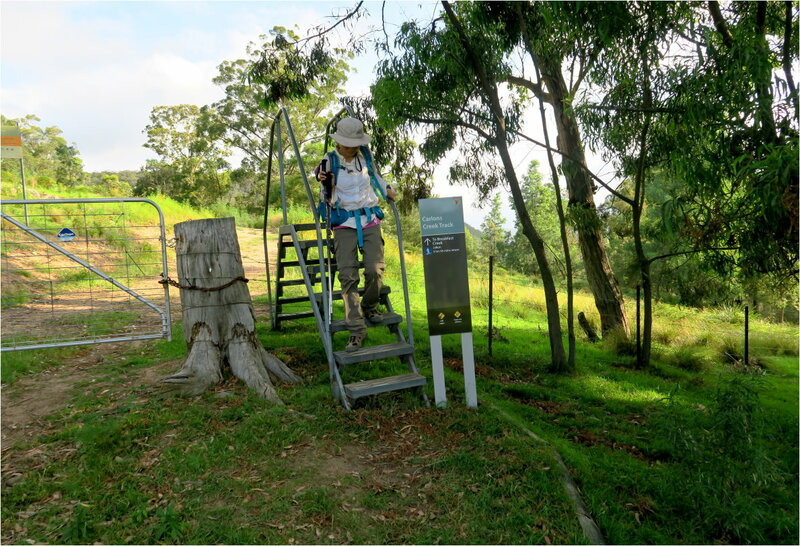 69) 12 and a half hours after we started walking this morning, RZ and I climb the stile back to Dunphys Camping Area. It is a long but rewarding day ... we've climbed all the 5 Wild Dog mountains ! Thank you to RZ who accompany me to complete this trip which has been on the top of my to-do list for quite a long time. 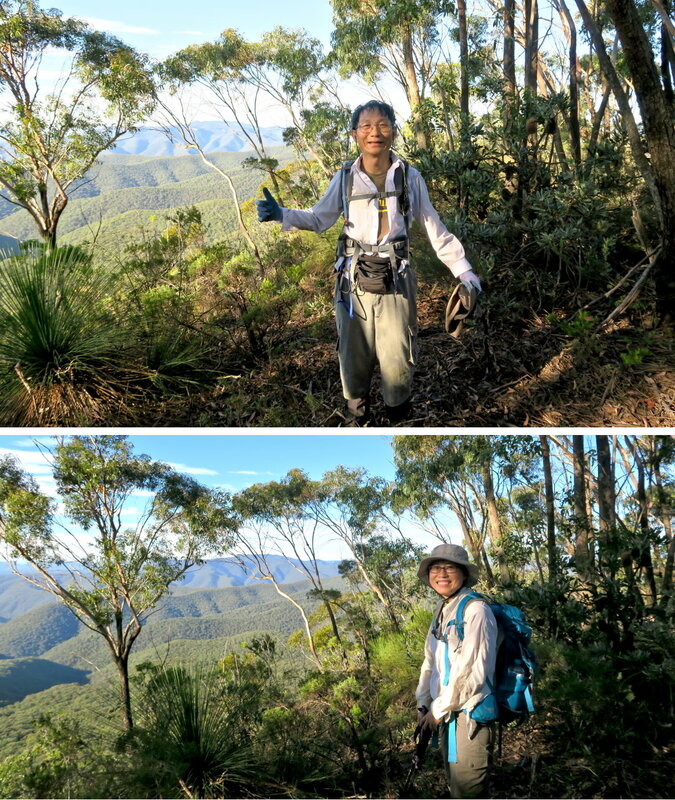 2016-08 Climb Mt Warrigal via Lyrebird Point and Faithful Hound Ridge; return via Medlow Gap Northwest Firetrail. 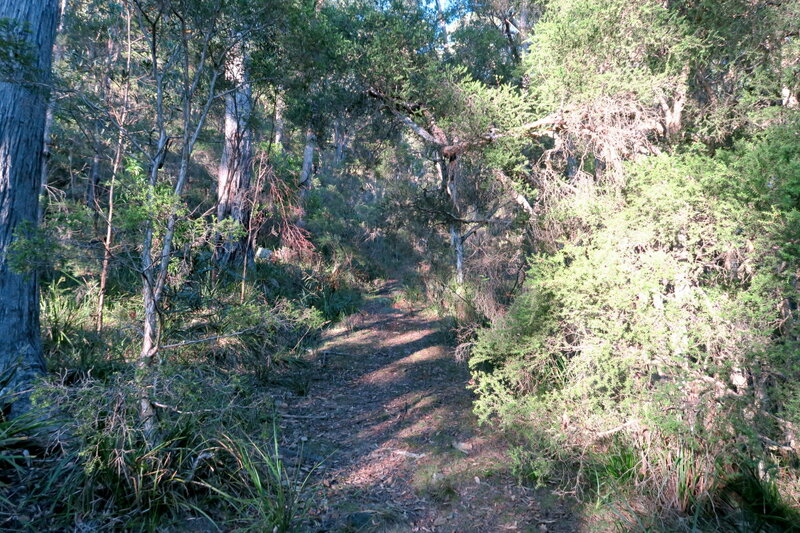 - Ascent point up the Mt Warrigal escarpment: East side of the mountain. 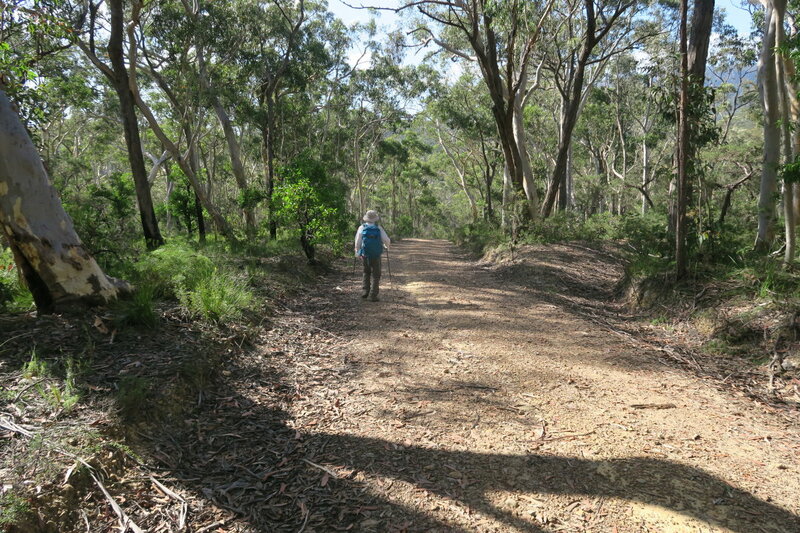 2015-04 Climb Mt Warrigal via Carlon Creek Track and Black Horse Ridge; return via Medlow Gap Northwest Firetrail. 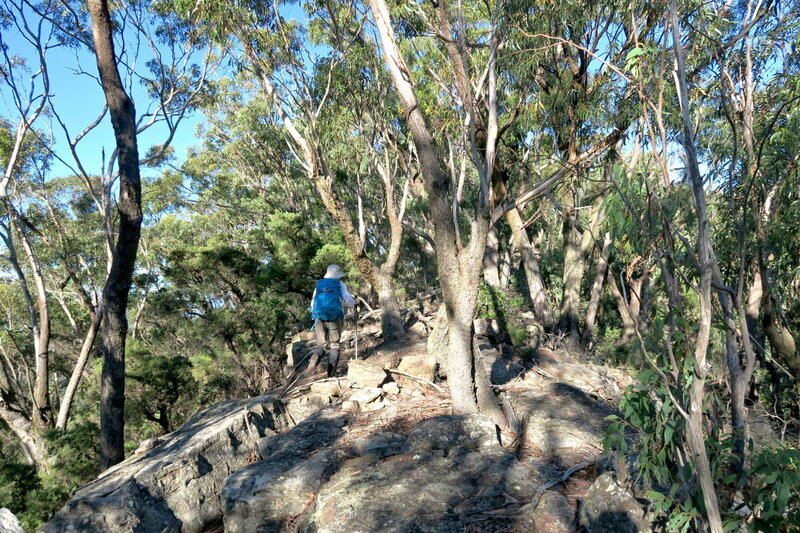 - Ascent point up the Mt Warrigal escarpment: West side of the mountain. 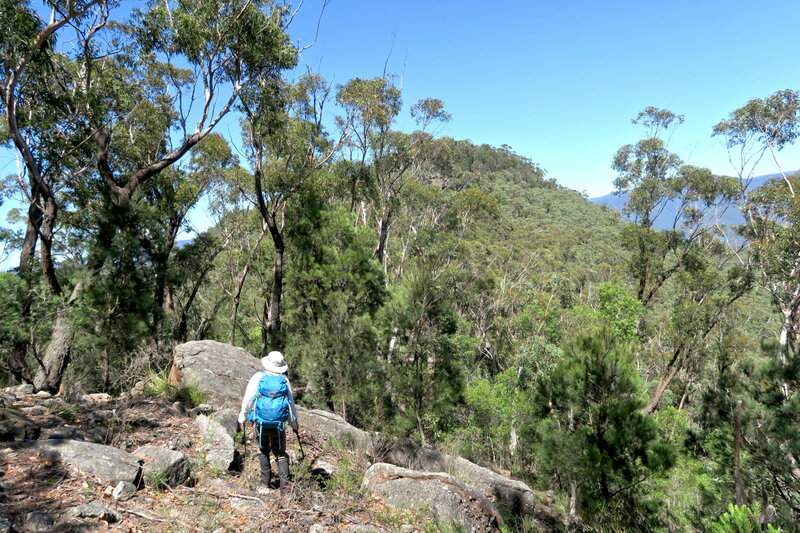 2015-02 Climb Mt Mouin & Blackhorse Mountain via Bellbird Ridge and Faithful Hound Ridge; return via Cattle Dog Ridge.